We enable customers to reflect ther personality through their shoes; designed by the buyer themselves to create a truly personal, high quality gift. Why not take this one step further by embossing your shoes and leather goods? 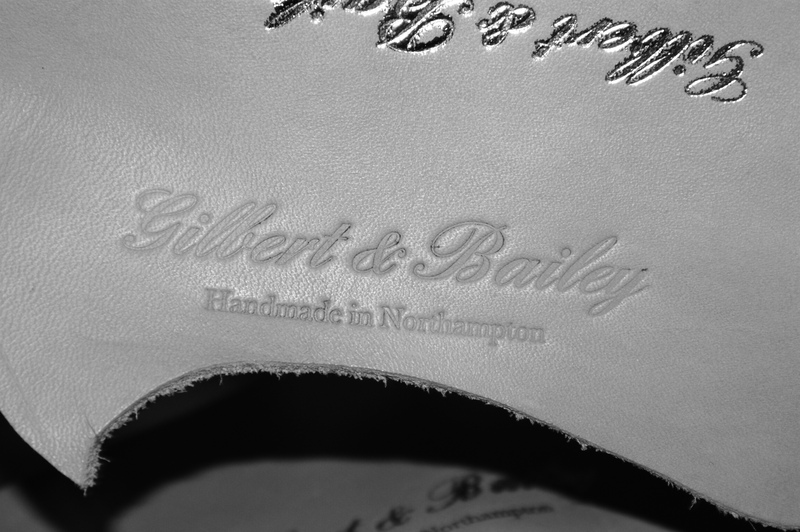 Gilbert & Bailey takes great care to block initials by hand, with each custom letter set adjusted individually to ensure the spacing achieves just the right balance and the emboss remains very crisp and delicate. This is done by a specialist craftsperson in our workshop and is complimentary with all bespoke shoe purchases. For leather goods we ask a small fee for this service. We can also make personalised or fully bespoke ranges for corporate gifts and special occasions. Making a lasting impression, our corporate gifts are designed with care to ensure each item will be truly useful and cherished, while still imprinting the company's own mark. Please contact us to discuss your bespoke commission.